+ Palle Danielsson, Joey Baron, Michel Portal u.a. 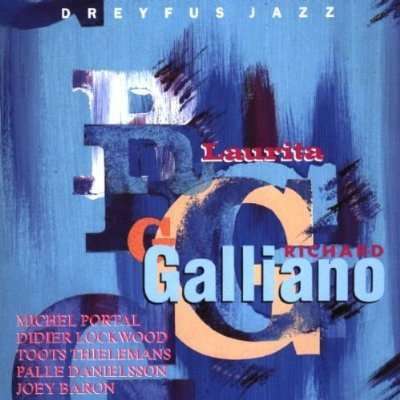 For his second record on Dreyfus Jazz, Richard Galliano has invited along some musicians of his genre. He had the good taste to select an outstanding rhythmic section made up of Palle Danielsson on double bass and Joey Baron who with a minimalist set of drums in front of him, is able to create with each piece a daring performance, lively and tranquil at times but always on the lookout for something new. He shared this musical adventure with jazzmen of his standing, of his own calibre. Improvisers like himself, single, free and eclectic. Outstanding artists who on their own instruments know exactly how to be innovative and how to bring their own talents to the fore. - Michel Portal a musician with a good following shuns being stuck with any label and putting anything up on a pedestal, be it a particular style, trend or even a school. - Toots Thielemans irreplaceable virtuoso of the mouth organ who Galliano compares on a par with the outstanding talents of the master Astor Piazzolla. - Didier Lockwood, a wonderful violinist born to ethereal swing and with a daring imagination. This combination of talent couldn’t possibly fail to produce a stunning record where the musical unions are just incredible and truly inspired. A unique, dreamy and deliciously nostalgic vein runs through all the music by Richard Galliano. The melancholy of Paris, close to the heart of Charles Baudelaire, under his fingertips, turns into the authentic blues of Panama. A blues sound which has no hesitation in rubbing shoulders with the melancholy of the tango or teaming up with the «destroy» accordion, disrupting the harmony with the newly discovered sound of Clifton Chenier, king of zydeco.